Biomagnetic cell separation is an alternative to centrifugation, columns, filtration and precipitation. It is usually faster and simpler, and eliminates undue cell-stress and reduces the risk of negative impact on cell function and phenotype. However, this is not true of all biomagnetic separation processes. The type of separation rack determines whether the separation will be gentle for the cells or cause cell stress and lysis. Traditional separation racks are not as gentle as homogeneous biomagnetic separation racks. 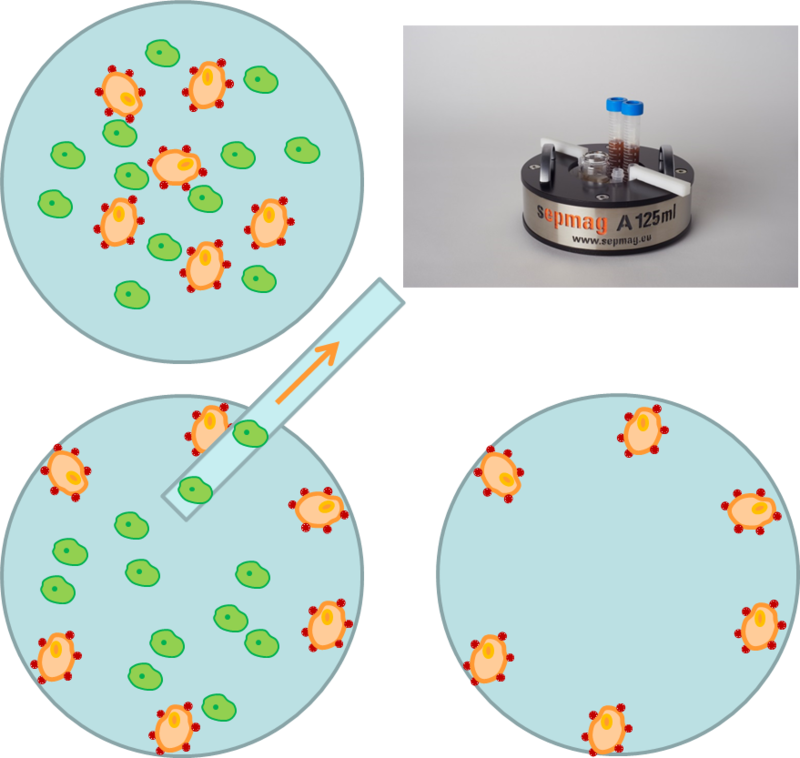 Magnetic beads are added to a cell-sample, which is then incubated. The magnetic beads then attach to cells via antibodies, pectin or other substances. If the right biomarker is selected, only the desired cells are labeled. When these labeled cells are placed with the entire mixed-cell population into a Biomagnetic Separation system, the targeted cells are pulled by magnetic force, separating them from the cell culture with the attached beads. There are two types of biomagnetic separation: positive and negative. Separation can be positive by labeling the cells targeted for analysis or culture. Unlabeled cells are then pipetted out and discarded. Alternatively, negative separation labels unwanted cells which are left in the retention device and the supernatant is extracted and retained without them. In spite of the numerous types of magnetic beads available, the process does not always work as well as it should when a traditional separation rack is used Most of these problems are not related to the beads or the biomarker, but to the separation rack. A traditional separation rack doesn’t scale with the sample size and doesn’t provide an even magnetic force gradient throughout the working volume. This can lead to poor recovery due the lack of magnetic force farther from the magnet. This problem cannot be fixed by using a stronger magnet because in that case the cells closest to the magnet can becrushed by excessive retention force. The problems associated with this traditional design only get worse as the sample volume increases. All the great efforts made to select the right markers and magnetic beads to ensure their correct attachment to the desired cells goes to waste if the wrong magnetic separation rack is used. To ensure optimal performance of the magnetic beads selected to capture and separate cells, the value and profile of the magnetic force should be carefully selected to ensure high recovery rates and gentle retention. This can be accomplished by upgrading to a homogeneous biomagnetic separation rack. These racks are designed with a geometry that provides homogenous magnetic force over the entire sample. These racks can be scaled to work well with any sample volume, and result in high recovery of target cells while being rapid and gentle. The magnetic cell separation process can truly be an improvement over other separation methods once a well-designed separation rack is used. Remember to download our newest guide Does it matter which magnetic separation rack I use in my cell isolation processes? if you want to know everything about this topic.